House set alone (no neighbours) with 4 double bedrooms and a superb view. Situated alone amongst the trees high above the River Lot in an area of great beauty and tranquility La Maison du Saut de la Mounine is a wonderful setting for a holiday. It is a fully equipped modern house with an above ground pool,a four-man canoe, bikes,table-tennis,table-football, badminton/volleyball net, swing,hammock,barbeque,large,wide balconies with extensive views over the Lot valley and far beyond. Walking maps, guides, natural history and history books as well as a collection of ' good reads ' (mainly English )are to be found in the sitting room. Many kinds of board and card games too plus a DVD player and a selection of dvds. 10% discount for couples only throughout the year. The house was brilliant. Just what we wanted. Safe for the children, a safe pool, comfortable property and welcoming owner, Rose. The terrace was the perfect breakfast and evening location. Quiet too. Just the occasional hang-glider drifting past on the thermals. A wonderful holiday! I'm happy that you had a great holiday. 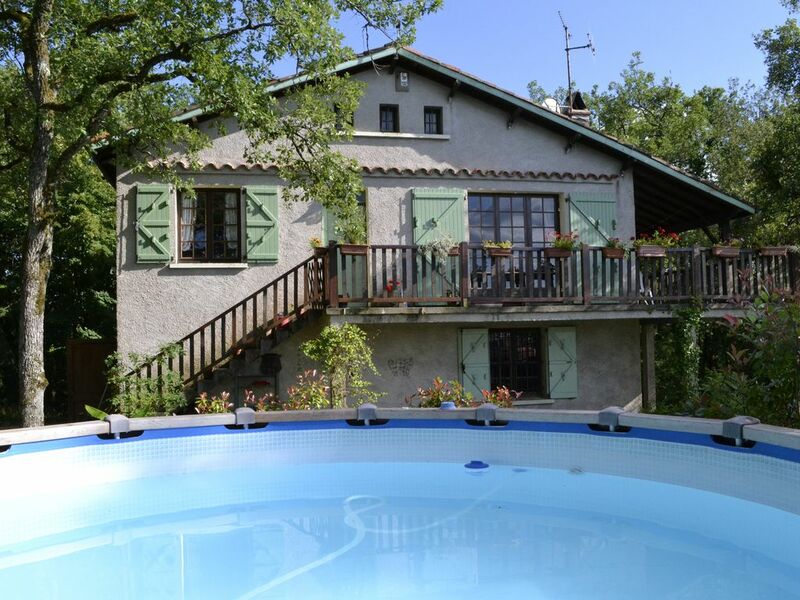 La Maison du Saut de la Mounine is a fantastic place for a holiday. The house is spacious and well-equipped with lots to do both inside and out and the view is really breath-taking!. The countryside around is unbelievably beautiful and we spent hours exploring the little Medieval villages and walking the hiking trails. The market in Villefranche was a great morning out and we had some really good, inexpensive meals in local restaurants. We found Rose helpful and informative and we wholeheartedly recommend a stay at La Maison du Saut de la Mounine . "This house is delightful. We have been several times.The surroundings are in the deep country, with a stunning view thrown in. There are great walks,- in the orchid season, a large variety of wild blooms, -wild life,-we saw red squirrels and hares, and a large range of birds. It is well equipped, clean and comfortable. Thoroughly recommended, especially in the Spring and early summer." La maison est conforme à la descritpion, calme, isolée, le paysage est splendide... parfaite pour les amateurs de la nature. Nous recommandons vivement cette magnifique maison!!! "La location est vraiment géniale. Une grande maison sur 2 étages pour vous tout seul. ce qui en fait l'endroit idéal pour vous reposer (sauf les grillons qui sont particulièrement bruyant). Une TV (chaines hertziennes seulement et pas de bonne qualité) avec lecteur DVD. Un récepteur satellite mais uniquement chaines anglaises. Le décodeur TNT ne vous permettra pas de capter beaucoup plus que les grandes chaines (pas direct 8). Pas réception internet sur le secteur (pas de freewifi). La paix donc, les vacances ! Un endroit idéal pour une semaine de vacances en famille. Salon de jardin sur terrasse abritée du soleil. Prévoir jeux de cartes et jeux de sociétés. Sinon si vous aimez foie gras et vins, allez voir la cave AUFIL des Saisons Gare de Conduché 46330 Bouzés. From Cajarc follow signs to the village of Saujac and the beauty spot Le Saut de le Mounine.La Maison du Saut de la Mounine is the only house ever to have been permitted to be built in this outstandingly beautiful area. Because of its location La maison du Saut de la Saut is ideally located for those who wish to do nothing at all.Its balconies high in the trees and the birds and the views and the sunsets are enough,along with bikes and canoe and wonderful walks along shady tracks and paths lost to time. And you could go paragliding/hangliding from the end of the garden !Really. At the end of the day many excellent restaurants are located within a short drive and the vineyards of the Gaillac region only 1hr to the south.The Caves of Peche Merle, where you can still see incredible REAL stoneage paintings is half an hour away in the Cele valley.